Assume you have a home valued at $500,000 and you have a mortgage of $100,000. Assume an interest rate of 8% (this is exaggerated in the current market but important for illustrative purposes). Also assume that you have an investment that gives you a return of 6% and you can lock it in. You may think this is unrealistic, but the 6% return is achievable; I just made such an investment. Now borrow $100,000 at a cost of 8% for 30 years. I have calculated the cash flow required to service this loan over that period of time, and it will cost $264,155 to pay off the $100,000. If you invested that $100,000 at 6%, what do you think the value of that investment would be in 30 years? $602,258. You just made $338,103 ($602,258-$264,155). So would you like to invest the $100,000? In other words, if you free up the $100,000 from your mortgage—money that is normally locked up in the equity—you can invest it to generate a benefit of $338,103. You really don’t need to get a return of 6%. All you need is about 3% to cover the cost of the mortgage. What you see from this example is how money works—and I will give you other examples. I considered the extreme of getting returns of 3% and 6% and how it compares to the cost of an 8% mortgage and from the chart above where the average interest rate over 30 years was 8%. Should you concern yourself with rate risk or return on your money? These types of gains are possible even if you refinance with a new 30-year mortgage; however, with the introduction of more creative mortgage products, the opportunity is magnified, and if you use these creative products, rate risk should not enter into the discussion because the return should always be better. Around 1995, various adjustable rate mortgages were introduced, and they gave the borrower the option of not paying off the principal. In some cases you could extend the life of a mortgage for up to 40 years. 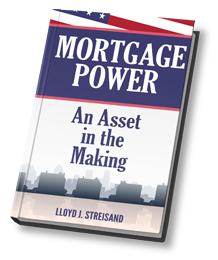 In essence, the mortgage world became much more sophisticated. The mortgage “gods” also allowed a fixed adjustable rate term of less than 30 years because they realized that most people do not keep their mortgages for the entire term. So why have a 30-year fixed rate mortgage when interest rates are much cheaper for a shorter term adjustable rate mortgage?